The Petroleum Sorbent Roll, High Capacity is a selective sorbent which will "sorb" hydrocarbon-based liquids (oleophilic) and repel aqueous based liquids (hydrophobic). 3M Occupational Health & Environmental Safetyum Sorbent Roll, High Capacity is a selective sorbent which will "sorb" hydrocarbon-based liquids (oleophilic) and repel aqueous based liquids (hydrophobic). The roll is 38" by 144' long. High capacity sorbents have a scrim on one side to increase strength and eliminate linting. 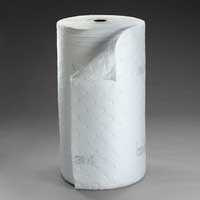 Rolls of sorbent material are used to cover and sorb large spills or in areas where spills may occur. They can be cut to the desired length and are the most economical way to purchase sorbent. , 3M Center, Building 275-6W-01, P.O. Box 33275, St. Paul, Minnesota 55133-3275. Tel: 800-896-4223; Fax: 800-542-9373.